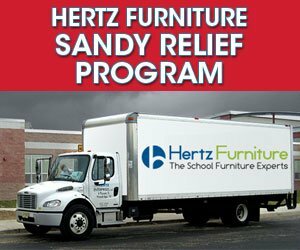 In the aftermath of Hurricane Sandy, Hertz Furniture has established the Hertz Furniture Sandy Relief Program, designed to provide immediate aid and assistance to schools and others affected by the deadly storm. Numerous states sustained widespread damage and devastation during the unprecedented hurricane. Moved by their plight, Hertz Furniture has partnered with six leading furniture brands to help people get back on their feet and recover as soon as possible. From now through Thanksgiving (November 21, 2012), schools and businesses affected by the storm are being offered 20% off the price of over 1,100 school and office furniture items. The discount is available by phone order only and to customers in the following states: VT, RI, MA, CT, NY, NJ, PA, MD, DC, VA and WV. Schools can contact their local Hertz Furniture representative, while other customers can call the Hertz Furniture Sandy Relief phone number at 888-494-3314. Recognizing that furniture is needed immediately, Hertz Furniture and their partners are committed to expediting shipping by sending out all orders via Quickship. Hertz Furniture has also pledged to donate a portion of all sales until Thanksgiving to the American Red Cross Disaster Relief Fund. "We were all caught off guard by the wrath of Hurricane Sandy and realize that schools and others did not budget or plan for these events," says Hertz Furniture President Saul Wagner. "While we cannot reverse the destruction incurred by the storm, we have teamed up with some of our closest partners to help people regroup, rebuild, and restore a sense of normalcy as soon as possible. The discount and quick ship are the least we could do." For over 45 years Hertz Furniture has supplied schools, religious institutions, businesses and government offices with top quality commercial furniture and superior customer service. Speedy Quotes, Quick Ship products, a wide selection of Eco-Friendly furniture, a free Project Planning and Design service and the best warranties in the industry are just a few of the ways that Hertz Furniture provides added value to its customers. For additional information on Hertz Furniture and its extensive line of products, please visit Hertz Furniture, speak to a furniture specialist at 888-793-4999, or send an email to Jonathan Yunger. Your email address will remain private and be used exclusively to validate your comment.